Washington Avenue Coalition / Memorial Park is moderately walkable, is bikeable and has a few nearby public transportation options, according to Walk Score's rating system. So what does the low-end pricing on a rental in Washington Avenue Coalition / Memorial Park look like these days--and what might you get for the price? 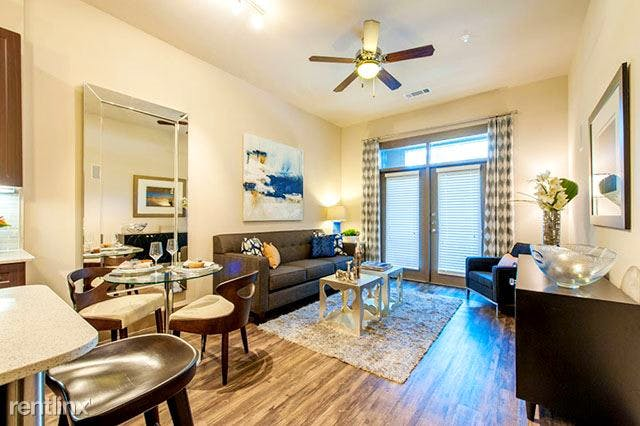 We took a look at local listings for studios and one-bedroom apartments in Washington Avenue Coalition / Memorial Park via rental site Zumper to find out what budget-minded apartment seekers can expect to find in this Houston neighborhood. Listed at $1,042/month, this studio apartment, located at 4902 Memorial Drive, is 25.1 percent less than the $1,391/month median rent for a studio in Washington Avenue Coalition / Memorial Park. Building amenities include assigned parking, a swimming pool, a fitness center, outdoor space and an elevator. In the unit, you're promised air conditioning, a balcony, in-unit laundry and a dishwasher. If you've got a pet, you'll be happy to learn that cats and dogs are welcome. There's no leasing fee required for this rental. This one-bedroom, one-bathroom apartment, situated at 7105 Old Katy Road, is listed for $1,110/month for its 617 square feet of space. In the unit, anticipate air conditioning, carpeted floors, a balcony, a dishwasher, a walk-in closet and in-unit laundry. The building provides a business center, an elevator, a fitness center, garage parking, on-site management, outdoor space, a lounge, secured entry and a swimming pool. Pet owners, take heed: cats and dogs are permitted. The rental doesn't require a leasing fee. Listed at $1,287/month, this studio apartment is located at 4020 Koehler St..
Building amenities include assigned parking, a swimming pool, a fitness center, an elevator and on-site laundry. In the unit, which comes furnished, expect to find both air conditioning and central heating, hardwood flooring, a balcony, a walk-in closet, in-unit laundry and a dishwasher. Pet owners, take heed: cats and dogs are welcome. This one-bedroom, one-bathroom apartment, situated at 230 T C Jester Blvd., #396, is listed for $1,295/month for its 708 square feet of space. In the unit, you'll find a balcony, a dishwasher, in-unit laundry, hardwood flooring and a ceiling fan. Pet lovers are in luck: cats and dogs are welcome. And finally, here's a one-bedroom, one-bathroom apartment at Katy Freeway, which, with 713 square feet, is going for $1,300/month. The building offers assigned parking, a swimming pool, a fitness center, a business center, outdoor space and an elevator. In the unit, anticipate high ceilings, air conditioning, a mix of hardwood floors and carpeting, a balcony, garden access, a walk-in closet, in-unit laundry and a dishwasher. For those with furry friends in tow, know that cats and dogs are allowed on this property. Future tenants needn't worry about a leasing fee.